Johannesburg - In Bafana Bafana’s last three outings, the side has failed to find the back of the net. Having lost 1-0 to Norway and playing to a goalless draw with Algeria, in their two respective international friendlies, Bafana played to a dull 0-0 draw against Cape Verde in the opening game of the Africa Cup of Nations. According to the soccerladuma.co.za website, despite not scoring, the team has not created enough goal scoring opportunities in front of goal. The nation is desperate for the team to find their confidence and play an attack-minded brand of football. 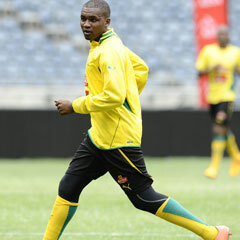 Striker Katlego "Killer" Mphela says that they need to be composed in front of goal. He told the Siya crew that it's not just about the strikers, but the whole team, as they play as a team. "It is not good that we can't score. As a team we need to be composed in front of goal. We need to create more chances and score. We have chances, though they are few, but we are not composed enough to convert them. “I know against Angola we need a win and we have to be confident in front of goal and make sure that we can score. If we win against Angola then we have a better chance of qualifying for the quarterfinals," Mphela explained.